The Russian aviation industry has a very long history, and in many ways was ahead of the rest of the world. Igor Sikorsky, for instance, built the world’s first four-engined aircraft and flew it successfully, both before and during the First World War. While these larger, more prominent successes are relatively well known, the world of water-based aircraft is largely left untouched. 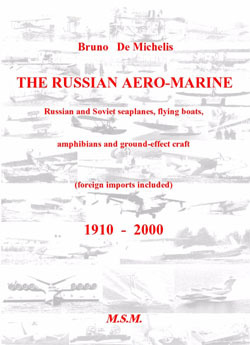 This title by Bruno De Michelis changes that, and in one giant leap the field of Russian seaplanes is opened for all to examine. The book is broken down by year, starting in 1910. These early tsarist forays into aviation are fascinating, and quite surprising by the sheer number of people building aircraft. Not only does this book include indigenous designs, but also those brought from Western Europe, so along with the Grigorovich, Gakkel and Sikorksy designs, we see Voisin, Curtiss, and Farman aircraft as well. There are no entries for the year 1918, which is understandable given the unsettling events in that year. The tsarist regime fell to the Bolsheviks, who then settled for a separate peace with Germany to get out of the war. The soviet system was extremely disruptive to existing industry as factory ownership shifted from individuals to the state. Further accentuating these issues is the presentation of nothing but Western designs in the 1919 section, and a note of the end of the Imperial-era Grigorovich line in the 1920-21 section (don’t worry, he makes a comeback). Following that tumultuous period, though, we begin to see some new names in Russian aviation, and the fascination with seaplanes continues. Collaboration with former German designers, specifically Junkers, shows up in the latter half of the 1920s, and in the summer of 1925, the OMOS, or Experimental Seaplane Construction Division, was created, headed by Grigorovich. Throughout the late 1920s and 1930s, a solid blend of indigenous and imported designs remained, with more designers trying their hand at seaplane design. Polikarpov, Tupolev, Shavrov, Beriev, and Yakovlev all produce some seaplanes during this time, while notable foreigners such as Heinkel, Junkers, Dornier, and Savoia Marchetti all had aircraft imported to the Soviet Union. The 1930s saw some truly interesting designs fly in the skies over Russia. As the Second World War approached, these European designs were supplemented by imports of notable US seaplanes, like the PBY Catalina and the Martin M130. The wartime years saw a great number of seaplane designs show up in the Soviet Union, either through indigenous design, Lend-Lease, or capture. Following the war, the seaplane took a back seat to other advancing technologies, such as jet engines, but Beriev remained interested in the subject and continued to innovate. While much of the rest of the world abandoned the seaplane, Beriev’s designs advanced the concept to the point now, where Beriev could be listed as the world’s best seaplane designer. Current aircraft include the A-40 Albatross, a jet-powered flying boat that is very impressive, and unmatched by anything in the world. In addition to traditional flying boats, the Russians experimented in a couple of areas not explored by others: ground effect aircraft and flying boat gliders. While the famous Ekranoplan designs have received much attention in recent years, the concept of flying boat gliders has never been explored before. While this entire book is fascinating, this chapter is probably the most interesting due to the rarity. The book is filled with excellent photos and drawings covering nearly all of the aircraft portrayed, and its weighty 324 pages make it a comfy chair-type of book. Pour yourself a nice cup of coffee, adjust the lights, get comfortable and lose yourself for hours in this meticulously researched book. Anyone interested the combination of air and sea will enjoy this book. My sincere thanks to Bruno De Michelis for the review copy. For ordering information, and to view some sample pages, be sure to visit his website. BACK TO "THE RUSSIAN AERO-MARINE"